7.43 points at 21 votes (rank 227). 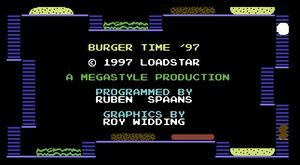 In this arcade game, which is a remake of the classic Burger Time, you are the head cook and need to prepare some hamburgers, hotdogs and sandwiches. This is very simple by reaching the corresponding ingredients over ladders and transporting them downwards by walking over them. So this gets not too easy, Mr. Egg, Sausage and Gherkin really disturb you. If you touch them, you will lose a life. As your own defense you can stop the troublesome eggs, sausages and gherkins for a short time with portions of pepper. As an alternative you can also put them into the burger. The pepper portions can be added to by collecting kitchen items that appear for a short time (as bottle of ketchup, salt caster, bowl of chips). Seven different levels of rising game speed with a maximum of 5 enemies await you and whet your appetite. The graphics seem rather refreshing. The animation of the characters is done quite successfully. A nice background music and many sound effects accompany the game. The controls are very easy, walking and climbing is done by moving the joystick into the corresponding direction, the fire button is need for throwing pepper. You start with 4 enemies, 4 portions of pepper and 4 lives. For each 10.00 points there is an extra life. If you lose a life the current stat of the level is preserved. At the place on the ladder where you start you can hide from the enemies. Every part of the burger that falls into the plate or falls 1 level lower counts 50 points. Eggs, gherkins and sausages that get into the burger count 200 points. The collected pepper caster at least 300 points. Eggs, gherkins and sausages that fall down while being on a burger part get you 500 points. 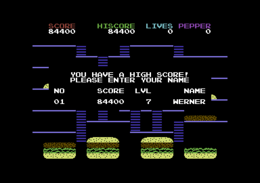 The version by "F4CG" has next to different trainers (unlimited lives, unlimited pepper, invulnerable, jump level) a saveable highscore list. Jodigi: "The remake is very felicitous and fascinates even more than the original version." Werner: "Numerous improvements to the botched original." Robotron2084: "The graphics are still lousy compared to the great arcade original but at least the game is fun to play. It is fluent and fast and enjoyably difficult, as the enemies have been equipped with a rudimental intelligence. Motivation instead of frustration is to be expected. Added to that is the highscore saver, what else could you ask for? That's why I give 7 of 10 points." F4CG "+4H" Version: Recommendable because of highscore saver and trainer but crashes after hitting RESTORE . For this game, as far as already known, there was no official cover released. This page was last modified on 4 October 2015, at 12:49.